Chinese Ambassador Qiu Guohong on Tuesday warned that the deployment of Terminal High Altitude Area Defense batteries in South Korea could "destroy" bilateral relations. "Much effort has been made to develop bilateral ties to today's level, but these efforts could be destroyed in an instant with a single problem," Qiu said. 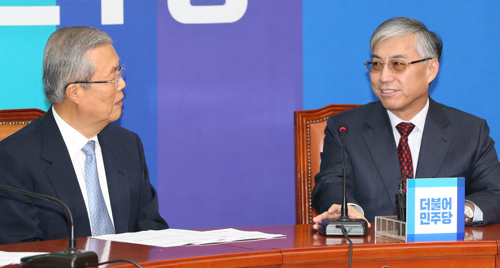 Qiu made the comments in a meeting with Kim Chong-in, the interim chairman of the main opposition Minjoo Party. The comments were quoted by party spokesman Kim Sung-soo, who was also present at the meeting. Kim quoted Qiu as saying bilateral relations "could take a long time to recover." Qiu called on Seoul "to reconsider if its safety is guaranteed" in case the THAAD deployment triggers a regional arms race. Kim Chong-in (left), the interim chairman of the main opposition Minjoo Party, talks to Chinese Ambassador Qiu Guohong at the National Assembly in Yeouido, Seoul on Tuesday. Beijing is worried about the deployment here of the anti-missile batteries that form the core of the U.S. missile shield aimed at containing China, though Seoul and Washington insist they would only be positioned to defend South Korea against North Korean attacks. Kim said the Chinese envoy spent most of his 45-minute meeting with the party chairman discussing the THAAD issue. But Qiu said China would trust a pledge by its "good friend" South Korea to narrow the radar range and functions of THAAD batteries if they are deployed here, but voiced concerns if the U.S. retains full control of the deployment, upgrade and control of the missile system. "I do not deny the fact that THAAD would play a role in protecting [South] Korea, but it will inevitably target China and Russia," he said. He also warned that the THAAD deployment "would break the strategic balance in the region and create a vicious cycle of Cold War-style confrontations and an arms race, which could escalate tensions." It could also weaken international cooperation in dealing with North Korea's nuclear program and other provocations. "Without the THAAD issue, a new UN resolution would have been adopted already," he said. Regarding North Korea's nuclear test and missile launch, Qiu said China is "firmly opposed" both. The Minjoo Party chairman said, "The government may have reservations about the deployment of THAAD batteries, but the North's nuclear test and missile launch have made the threat feel very real. That is why it is being negotiated." Meanwhile, China's Global Times slammed the THAAD plans in an editorial last week, saying "Once the THAAD system is deployed in South Korea, Chinese society will be bound to support the People's Liberation Army to respond via a strong enough military deployment in northeast. If so, South Korea may turn into a highly sensitive area in the game of military deployments between China and the U.S."
Hong Kong's Ming Pao daily last week also said that Chinese military could destroy the THAAD batteries deployed on the Korean Peninsula "within an hour."